In 1905, Bixby saw the inception of two businesses vital to a community, a newspaper and telephone service. 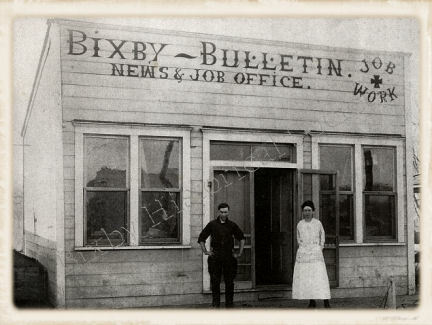 The Bixby Bulletin is the oldest continuous business operating in Bixby, today. First owned by W.W. Stuckey and Paul Tyler, the Bixby Bulletin has changed editors and formats, locations and priorities, however, it has remained a booster of Bixby, a chronicle of her history. “Centrally located in one of the richest sections of the fertile Arkansas River Valley, surrounded for miles with a level bottom land, gradually rising into a level prairie that extends as far as the eye can see, Bixby is situated in an ideal section as regards natual resources. “People in the older states who are contemplating a change cannot well afford to overlook the opportunities offered by this section of the Indian Territory. No country on the globe can offer greater advantages to the farming class than the section of country contiguous to Bixby; and not only are the advantages confined to the farming alone. Opportunities are great for the capitalist and investor as well as the stock raiser. 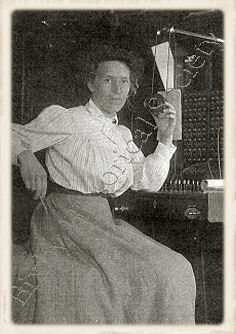 “Bixby does not owe her peculiarly striking advantages to any particular product. She has a good coal as is found in Pennsylvania, as good glass sand as Illinois, as fine sandstone as North Carolina; she can duplicate the hogs of Iowa, the mules of Missouri, the corn of Kansas, the cotton of Mississippi and the fine horses and beautiful women of Kentucky. The Pioneer Telephone and Telegraph Company installed a toll station in Bixby Drug Store in 1905. In 1906, E. M. Frisby purchased the franchise for a local exchange but didn’t do much to promote business. Telephones were still rate. Only eight percent of all homes in the United States had telephones at that time. Frisby sold his franchise to Aaron Hagaman in 1907. Dr. Lee Newlin and Henry Sample bought the telephone service in 1914 and changed the name to Bixby Telephone Company. The company served over 150 telephones that were associated with Bell Telephone long distance service. The growth of the town was slow but steady. A 1908 Oklahoma census shows a population of 150,000 whites, 18,500 Indians, Negroes and half-bloods. Six hundred of this population lived in Bixby. The Bixby Telephone Exchange was inaugurated in January, 1808. The first call made from the service, one to Oklahoma City, did not go through. The line was busy. Hagaman located his office on a dead end streets in *Midland Addition to meet the needs of both Old Town Bixby and the Midland Addition.